After diving for about one week in the mexican Cenotes, I wanted to snorkel a bit in some Lagunas, where the freshwater flows out into the sea. Not really expecting something interesting, I started to swim slowly into the lagoon, watching occasionally some colorful sea fish. They enter the lagoon in the lower layer of saltwater, but occasionally swim into the upper layer of freshwater, probably searching for food, and by the way passing the halocline and stirring up the layers. Suddenly, my interest was attracted by a strange movement on the ground in the distance. 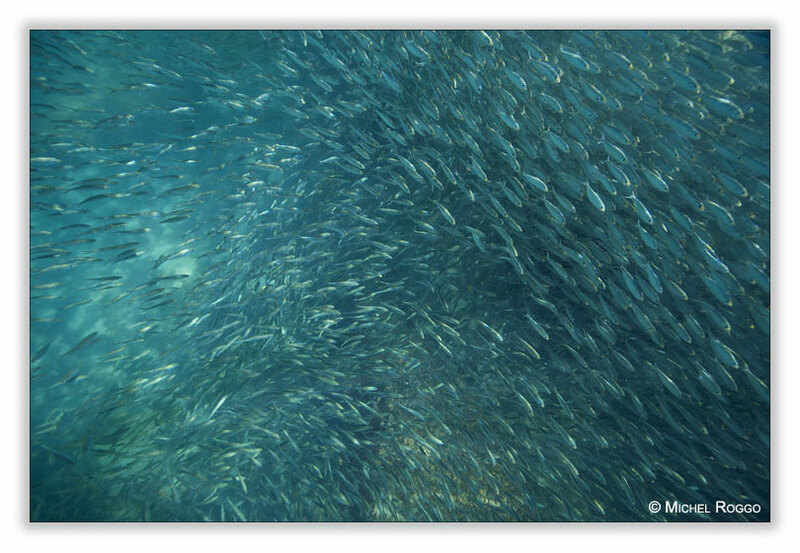 Approaching, I realized an enormous mass of fish - Sardines, as I later learned. I simply had never seen something like that before. 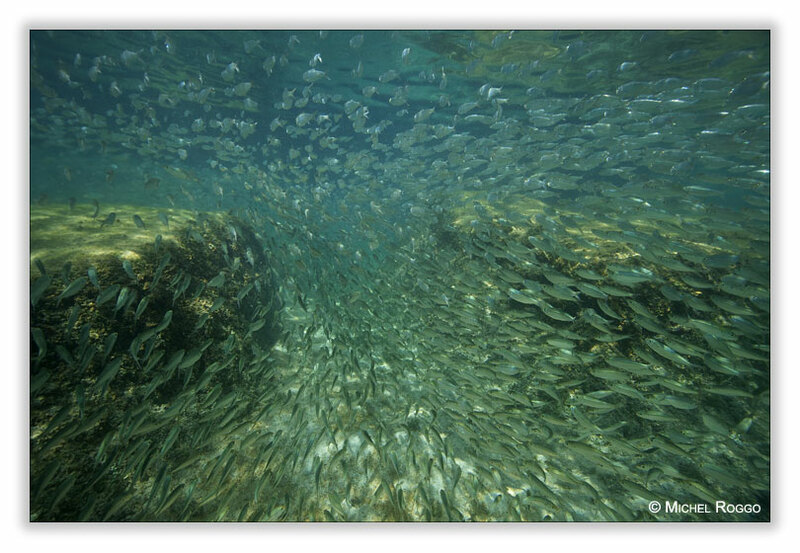 Of course I immediately started photographing this enormous school of fish. After perhaps half a thousand of images, I realized that I needed the view from the ground as well, and not only from the surface. 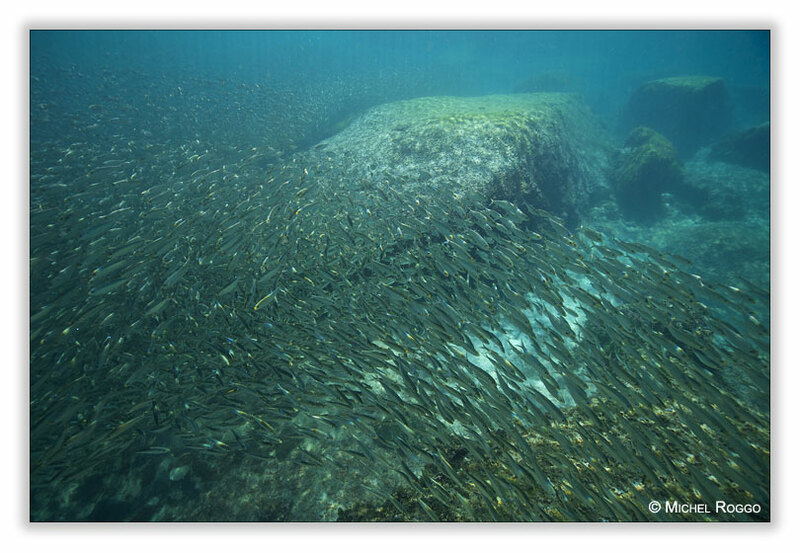 So I swam to the shore, took of my neoprene suit, returned to the fish, dived down to the ground, and, holding me on a rock, waited for the fish to swim nearby, to be in the middle of that dense mass of fish. That was really fun, but I was able to hold my breath until resurfacing only for about half a minute ... I definitely have to improve my freediving!